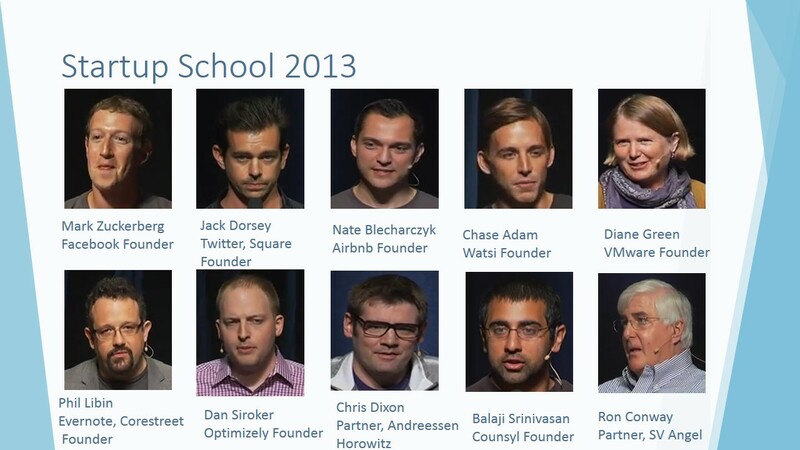 Startup School is an annual event created by YCombinator’s Paul Graham. It is also a must attend event for any aspiring technology entrepreneur. The best part? attending the event is free. However, if you want to attend, there is a lot of competition for limited seats. You will have to fill out an application and provide information about your education, work, developer tools, and “the coolest thing you’ve built”. So you better have something interesting to say as not everyone that applies gets to attend. Graham has stated: “Many founders have told us that this event was what finally made them take the leap”. It’s also probably a very good first step to applying to YCombinator if you want to get into the world’s most prestigious accelerator program. I was one of the lucky attendees selected this year and it was a life changing experience. If you are starting a startup, or even thinking about it, you must try to attend. Every speaker provides a different perspective into their story and their learnings, but the one thing that is common to all of them is their passion for what they are doing, and for how they are potentially changing the world. Also, spending a day surrounded by energetic like-minded individuals is extremely inspiring. First lesson: don’t be consultants. His first company was an ecommerce consulting business and he felt that although the rewards of building something for someone else were immediate, they were really not building anything lasting. Second lesson: build a product. After the consulting business he felt he wanted to build a product. He established a partnership with a brilliant individual but the problem was….. not one of them was in love with the product. Third lesson: build a product that you love. You should not build any product. Investors kept telling him to think about what the market wanted and reminded him that “he was not the target audience”. Which is important advice in the B2B space but not necessarily in the consumer space. In the consumer space you need to build something you love, and make it something that lasts as a company. To build something lasting as a company, you must not have an exit strategy, only a liquidity strategy. As they built Evernote, they were running out of funds and as he was making the decision to shut down, he got an email from a random guy in Sweden who said: “I love Evernote. I have used it for 2 months and it has changed my life. Do you by any chance need investment?”. They spent 20 minutes on Skype and the random guy wired him half a million dollars which was enough for the company to survive for 6 months. They received additional investment from international investors, but not Silicon Valley, and every investor was a fan of the product. Don’t be in this business if you want easy! It gets better but harder. In some sense more fun. It is not fun day to day. It is fun month to month. The only reason he can do this for the rest of his life is because he is doing something he loves, not just making some money. So remember to build something for you, something that you love, as that way you will know when it is great. Make something epic and you will know when you have achieved greatness. As you build your product, get feedback. Learn the value of the feedback loop. Focus on continuous improvement to build a lasting product. Dan shared what he would have wanted to hear when he originally attended startup school. His first approach into entrepreneurship started after doing research on machine learning and sentiment classification. He tried to apply it to the stock market, but never made a profit. Time from launch to first paying customer: infinity. He then decided to work for Google as he wanted to learn the skills that would make him successful as an entrepreneur. The most important thing he learned was the value of the feedback loop. (In his first startup he had no customers, so he never had feedback and could not turn that product into a successful one). In 2007 he heard Obama speak about how to bring data to government. He quit his job at Google and signed up as a volunteer. He joined the new media team to run A/B tests and became Director of Analytics for the campaign. His job was figuring out how to use data to help make better decisions. He used Adobe and Google products and got a ton of value out of those products. His second business was Carrot Sticks, an online game to teach math. His clients were teachers, parents, and kids. They were neither and had a difficult time prioritizing what to do next. Then they founded Spreadly, a platform to monetize social sharing. This time it took them a month to get their first paying customer. His current venture is Optimizely. The inspiration came from the time spent at the political campaign. He was running A/B tests but always required the use of a developer. He created a visual interface, and this gave clients the ability to do one time implementations without needing technical resources. It took him one day to get his first paying customer. It was also very easy to build this product because it is something he would have wanted for himself. Ron is an investor on Google, twitter, and snapshot among others. 40% of their startups go out of business. So they invest in human quality, sometimes not even caring about what the product is. What they look for…. Decisiveness. They need to make decisions and keep momentum in growing their company. They need to hire fast and fire fast. If there is dead wood in the organization, everybody else knows it. Morale can actually increase by making that decision even if it’s a co-founder. Are other people going to work for her/him? Are they a team builder ? are they leaders? can they manage 1000 people? or can they grow into it? Chris Dixon, Andreessen Horowitz Partner. The best idea is a good idea that looks like a bad idea. Good ideas that look like good ideas are already being worked on by academics, government, and large companies. How do you develop a good idea that looks like a bad idea? You need to know a secret. Something you believe that most other people don’t believe. How do you develop it? Know technical tools better than anyone else. Know technology better than other people. Dropbox is an example. File sharing needed to feel like a local drive. A brilliant MIT engineer cracked it. Know a problem better than anyone else. An example is Kickstarter. They spent 10 years trying to get funding. Draw from your unique life experience. An example is companies that specialized in protecting computers from spyware. Virus companies felt that wasn’t important because it wasn’t technical enough. What are the characteristics of a good idea that looks like a bad idea? They unbundle functions done by others. Look at newspapers. They have a brand (NY Times) and they have a curatorial function. They tell you what matters on the front page. They have classified ads. These functions over time have been picked off one by one by technologies like craiglist, social media, and blogs. Now, individual reporters are the main attraction (for example Nate Silver). Let’s look at education. Universities have a social role, educational role (coursework) and they act as credentials. 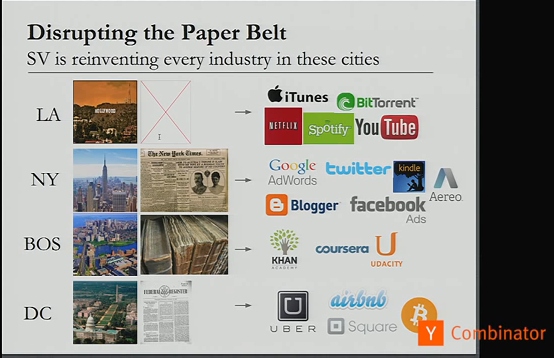 Now let’s look at Udacity, coursera, all MOOCS. They do not completely replace the university, but they replace pieces of the bundle. Find something to work on that you care more about than yourself. Watsi was the first nonprofit that made it into Y Combinator. Chase delivered a very emotional presentation describing how while in the Peace Corps sitting at a bus in Central America, he saw a woman get on the bus and collect money from strangers to pay for a health treatment for her child. She showed them medical records and inspired Chase to create Watsi, a portal to match donors with people needing health treatments throughout the world. He described how difficult it had been to get investors, as most people would pat him on the back, tell him how great it was that he was doing this, but did not invest. He described all the difficulties to get the business off the ground, and inspired the audience to look within for that “one thing” that we consider to be more important than ourselves. “This work is so hard, that it is only worth doing if it is that relevant to you”. His presentation was met with a standing ovation. Diane founded VMware, one of the most important enterprise software companies in the industry. She described how they started, and how one of the initial priorities was to get rock solid patents. Her conclusion: that did not help at all. The success of the company was defined by establishing partnerships with hardware vendors. She found a way for those vendors to make money, worked on building credibility, created a hardware partner program, and gave all vendors a deadline to sign up. (Piece of advice: always setup deadlines. Having a deadline helps in almost everything). Build what you want to see in the world. That will resonate with other people. Sometimes you will win the bet. Sometimes you will lose. Put the loss on the shelf and bring it back another day. The art spirit by Robert Henri. He describes an interesting parallel between artists and software creators. The end product is not the only important thing, the craft of making the product is important also. Doing, inventing within the work. Few have stamina to do it. “we are not here to do what is already been done”. Do not follow other footsteps. Do not copy others. Find your own path. A student must be a master. It is not enough to have thought great things before doing the work. We all have many ideas. What really matters is the work to implement those ideas. Don’t worry about rejections. Everyone that is good has gone through them. Don’t let it matter if your works are not accepted at once. The more personal they are, the more chance of them being rejected. You are painting for yourself. We work hard to get positive feedback. But it takes years and patience. There is a time and place for all things. What is difficult is to use them only in the proper time and place. You cannot do anything without common shared purpose. Without common purpose you won’t do anything that is timeless. Use fewer words, copy fewer things. Be short in words, long in meaning. The score takes care of itself by Bill Walsh. Bill coached the San Francisco 49ers. He took a team at the bottom and brought them to the top. He did it by focusing on the details. He said.. clean your lockers, tuck in your shirts. You start with an idea, a mission and go and find people to help you implement it. Establish a new standard of performance, specific attitudes and actions. Be clear communicating expectations of performance. Let everyone know you expect the highest level of expertise in their area. Teach beliefs. Teach connection. Measure. Be a leader. Show, not tell. What happens to an organization when you start winning? Four cities used to run the US: Boston (Higher Education), New York (Advertising, Newspapers, Wall Street, Books), LA (Movies, Music), DC (Laws and Regulation). Silicon Valley is becoming more important than all of them together. Balaji introduced us to the concept of Voice or Exit which is fundamental in Political Science. He established an interesting parallel between politics and technology, and how when something is not working, you can choose “Voice” and change the system from within” or “Exit” and leave to star something new. The US is a nation of immigrants and a nation of emigrants. It is shaped by both Voice and Exit. Silicon Valley is also shaped by Exit. Exit is about alternatives, and Silicon valley is the ultimate exit. Technology has disrupted the main industries in the country, it has reduced costs, and it is allowing people to opt out of the world and into a digital world. It is better to find a few customers that love you, than a lot of customers that like you. Airbnb took 4 years to serve the first 4 million guests. And only one year to serve the next 5 million. Nate shared the story of how airbnb started and mentioned the importance of developing confidence. “You are going to fail more times than you succeed. So confidence is needed to persevere”. Early in his career he took a corporate job and left it because he wasn’t learning. Every experience in your life should be additive. If not… Leave!!. After that he joined a startup and learned everything that should NOT be done. But every experience he had helped him be successful now. On the topic of co-founders he mentioned his belief that the most important quality in a partner is work ethic. But it is also important to have complementary skills. Choosing your co-founders is one of the most important decisions. You can change your idea, but it is hard to change partners. Do not rush into a relationship as they need to last years. Why was Facebook successful vs. other companies in the space? Because we cared more than everybody else. They had more engineering power, more money, servers, and time. So other companies could have done it, but the fact that we cared so much made a difference. As a kid he built tons of software that he wanted for himself. Games he wanted to play. Music players he wanted. In college he started building things to connect with people around him. He wrote Class match as he was trying to figure out what classes to take, or what his friends had taken. He wrote a script to scrape the school catalog so that people could comment on the courses. He always felt people were missing from the internet and got 2,000 users out of 6,000 in Harvard . By the time he started Facebook he knew people would be willing to connect and register. He has always been very focused on the idea of channeling the community’s energy. He started Facebook during a 3-week reading period at Harvard. What did it have that competing businesses didn’t? focus on real identity and connections. Before FB, there was information and content, but the one thing we care most about – people – wasn’t there. “Friending” was the key to the success of Facebook. Competitors had the nodes but not the connecting arcs. They also had less emphasis on identity and community. A lot of the reason why great stuff gets built is because it is kind of irrational at the time. But the people who care the most end up doing it. He considers “determination” to be the most important quality contributing to his success. So many things go wrong that you need that. You will make tons of mistakes. The important thing is to learn quickly from them. And not give up. Keep running through the walls. Hire someone you would work for in an alternate universe. The definition of a good team is a group of people that makes better decisions as a whole than they would individually as the sum of the parts. Smart people like learning. One of the thrills of staring a company is the learning curve. If you setup a team dynamic where you are constantly learning from the people around you. What is better? What do you care about the most? Connecting everyone. Communities of people can channel energy to create wonderful things. Some people have asked me which of the speakers was my favorite and although I got value from every one of them, Chase Adam’s presentation was probably the one I loved the most. His passion, and how emotional he was about his story, coupled with the reflection of “do only what is more important to you than yourself” truly made a difference in how I am approaching entrepreneurship now. If you want to see any of the videos, they are all posted on the Ycombinator Youtube Channel. ← Where are the Women in Computer Science?